We realise that people want some reassurance when they are paying for work to be carried out on their homes. This guarantees that the new roof covering provided by us will not perish or leak for the guaranteed length of time. If it does and one phone call to us will enable us to visit your property and rectify any problem with our roof. No works to or on the roof covering are carried out by anyone other than Stay Dry Roofing Operatives. Does not cover any damage sustained internally at the property. 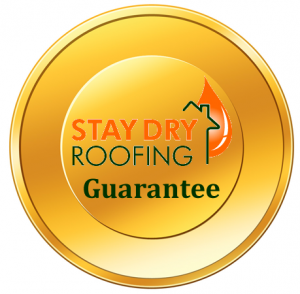 Our guarantees are only transferable once an inspection of the roof has been carried out to confirm the condition of the roof and that is has not suffered any damage that would invalidate the guarantee Once this inspection has been carried out anew certificate will be issued to the new owners, for the remaining time period. Our estimates show the guarantee that is offered for the specific works. Repairs carry our guarantee for 12 months. This covers our materials and the specific repair. However, sometimes with a repair the most obvious is not always the problem as water can trac from one place and end up leaking in a totally different area.